The most coveted of Bali wedding villas, the all-new 13,950 sq ft Imperial Villa is the ultimate location for a wedding, reception and honeymoon all in one idyllic venue. Blending contemporary tropical design with authentic décor and the sunset coast’s natural beauty, the three-bedroom villa is the pinnacle of Four Seasons Jimbaran Bay’s beach-luxe accommodations. The two-story layout offers majestic views across curving Jimbaran Bay and hosts up to 80 people for ceremonies and receptions on the upper level’s cantilevered lawn. On the lower level, the pool terrace and residential-style dining room offer additional space for cocktail parties and intimate dinners. Even closer to the sea, Gili Jimbaran invites couples to cast away on their own private island with waves lapping gently on a sandy cove just three meters below them. This secluded garden meets azure-blue seas on the very edge of the resort’s coastline, and has been remodeled and expanded to host up to 100 guests. It offers uninterrupted 180-degree views of Jimbaran Bay and secluded yet easy access to resort accommodations and facilities. “There is something naturally romantic and exotic about Bali. 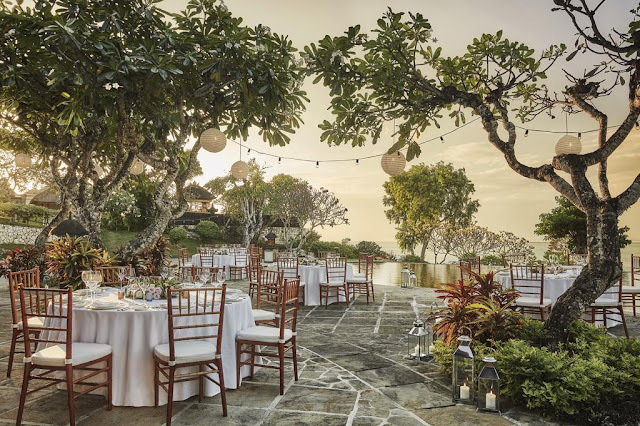 We are seeing more couples embrace this with open-air celebrations, connecting with the natural environment and local culture,” said Uday Rao, General Manager of Four Seasons Resorts Bali. From initial inquiry through to their big day, couples have one wedding specialist assigned as their dedicated point of contact, delivering seamless service with Four Seasons personalization, efficiency and genuine care. And the latest trends show how couples are deviating from the classic and getting creatively Instagrammable. Silent disco: Curfew? No problem. The party must go on when every guest has a pair of headphones to dance the night away. Dance lessons: From traditional Balinese dancing to salsa and even capoeira, a group class gets everyone on the dance floor learning new moves. Interactive dining: Bali’s tropical vibe inspires semi-formal themes and fun dining concepts. Out are formal sit-down three-course meals and in are local experiences like an Indonesian Night Market buffet or a Royal Balinese Megibung Banquet inspired by an ancient dining ritual dating back to the 15th century. Self-service sundae bars and cocktail-making classes on the side add another talking point for guests long after the wedding day is over. When the time’s right: Sunset is still the most popular time of day to say ‘I do’ in Jimbaran Bay; who can resist those sorbet-colored skies? But the ‘something blue’ on your wedding day may be the stunning view with a mid-morning ceremony followed by a beach-club party at Sundara. Another twist is serving a welcome cocktail before the ceremony, while waiting for the bride.